As the clock ticked towards the 78th minute at Croke Park on Sunday, Limerick supporters of a certain vintage experienced a horrifying sense of déjà vu. In 1994, their team had been cruising towards the end of the All-Ireland hurling final with a five-point lead. Offaly hit them with a late blitz and lifted the title thanks to an unanswered 2-5. Flash forward 24 years and Shane Dowling puts Limerick 3-15 to 0-16 ahead of the defending champions Galway. Surely the end of an All-Ireland famine stretching back to 1973 is in sight? Eight minutes of injury-time are announced. Murmurs of surprise. Conor Whelan lashes the ball passed Nickie Quaid. Stunned silence. Joe Canning buries a 20-metre free to the roof of the net. Oh my God, it’s happening again. "I’m not going to lie to you, I was a sub in 1996, on the panel in 1994, and I saw it happen in front of me. 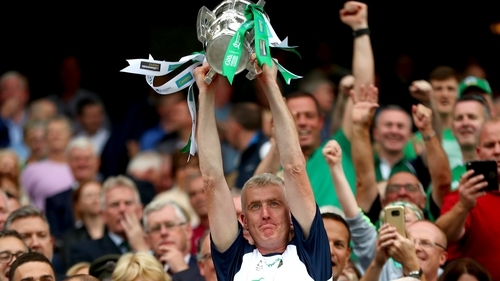 I’ve seen it happen in front of my eyes," admitted Limerick manager John Kiely afterwards. "You can’t block it out - you just acknowledge it and park it. Something else will happen to take your mind off it. "I know I felt, 'Oh crap, this isn't going to happen, is it?’. And you're just imploring the players to win those last few vital balls. "Can you imagine the pressure they felt under in those last 10 to 15 minutes? Just incredible. "That it was hard-earned makes it all the more special. We withstood that onslaught that came, not in the first 20 minutes, but in the last 20 minutes. The storm was a little late, but God, it was tough." It’s the last puck of a one-point game. Canning has a free deep in his own half. It drops short. Tom Condon brings it away. Limerick are finally champions. "I was calm now to be honest with you," Kiely told a disbelieving press room of the final seconds. "I was really calm. "He has done it on so many days for Galway. Just an incredible hurler, one for the ages and I don't think anyone should hold that shot against him, that's for sure." Darragh O’Donovan admits to being slightly more concerned: "I had my head in a towel for the free. "I had come off but you’re looking at one of the greatest hurlers of all time stepping over a ball. I remember the semi-final against Tipperary last year, he got a free in the same position, the ball came back out and he scored. "But Tom Condon was there, he’s been a great leader. He was able to redeem himself after what happened earlier in the year, (a red card against Clare). To have the coolness to catch it there. With Johnny Glynn in there anything could have happened." A lot of the build-up to the game had focused on the match-up of 6’5 Glynn and 6’0 full-back Mike Casey. But Glynn suffered from a lack of service on a day he was held scoreless and until Casey was forced off with cramp in the 48th minute he had the big man in his pocket. "He was probably under the most pressure of all the players because of the amount of commentary that was on his match up with Johnny Glynn," said Kiely. "While there was a total mismatch height-wise, Mike used every ounce of strength in his body to attack the ball. He really had a fantastic match. I don’t know who got man of the match but he is a contender." There was a touch of role-reversal in the closing stages of the game, Galway chasing down a lead and Limerick hanging on for the first time this summer. They had inflicted memorable come-from-behind defeats on Kilkenny and Cork already and were determined not to have to swallow their own medicine. "I didn’t want a big lead early doors because it becomes a weight on you"
"I didn’t want a big lead early doors because it becomes a weight on you," admitted Kiely. "We saw with the eight-point lead, when the momentum shifts back to the opposition, it’s so difficult to stunt that momentum and reverse it. "We spoke about that all year, the need to respond at key moments when things go against you - Richie Hogan’s goal in Thurles, here against Cork when we were six down with 11 minutes left. Something had to happen. "Sometimes when you have a big lead, when it starts to trickle away, the crowd senses the blood. It slipped a bit today but we just managed to squeeze enough of a response to hold our ground. "That key ball Tom caught, the ball Graeme (Mulcahy) won and got a point from - we managed to win just enough balls and to get those shots off to deter Galway and to withstand that onslaught." Limerick had lost five finals since 1973: 1974, 1980, 1994, 1996 and 2007. 45 years is a long time for a hurling-mad county to wait and Kiely spared a thought for those men in green who had soldiered in vain over that time. "It’s just an awful pity it took so long," he said. "We had fantastic teams in the eighties, 1994, 1996, 2007. Those groups would have fancied themselves other years but you had the knock-out situation. They were great teams, great players, but various bits and pieces didn’t go for them. "I’m delighted to be involved with this group, it’s an honour to be their spokesperson. I never thought, going back over the last seven, 10 years, that this is where we’d end up, but someone else had plans. "We’ve worked extremely hard, the team and management have made massive sacrifices and we’ve got our reward at the end of the day."